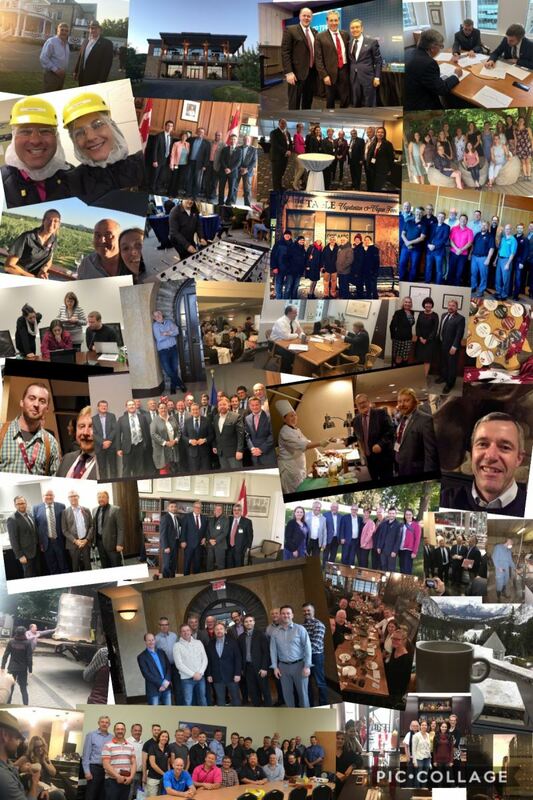 It is with great honour that I preface this 2018 Annual Report with an overview of the strategic work done by the CPC over the past year to advance, promote and protect the excellence of Canadian pork production through effective advocacy, programs, and communication. Remaining profitable in the very competitive global market is not a simple matter. An unpredictable trade policy environment and the expansion of African swine fever in Europe and into China exacerbated the normal market volatility. 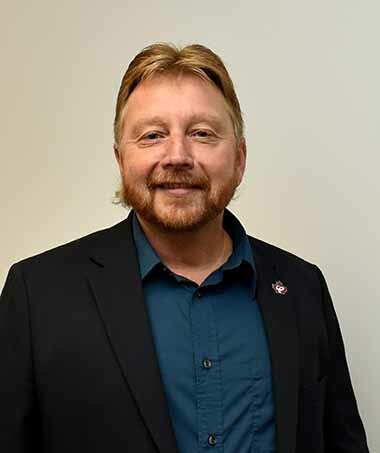 Now, perhaps more than ever, the Canadian Pork Council is focussed on initiatives designed to improve producer returns working in close collaboration with its provincial members. Within the Canadian Pork Excellence platform, considerable progress has been made in enhancing the Canadian Quality Assurance program and its Animal Care Assessment element. Each has been thoroughly updated and streamlined for easier use by producers. However, it is not enough to simply launch programs and hope for positive returns. In working closely with Canada Pork International, the Verified Canadian Pork brand has been strengthened to capture the advantages of Canadian Pork Excellence. The Canadian Pork Council ensured that federal legislators understood the importance of trade to Canada’s pork sector. CPC staff made sure that our message was heard whether directly or working closely with groups such as the Canadian Agri-Food Trade Alliance, Canadian Cattlemen’s Association or the Canadian Meat Council. While progress was made in working to enhance pork demand, there remain a series of concerns. Foremost among them was the Government of Canada’s proposed “Healthy Eating Strategy”. The Council is working to ensure regulators and politicians have the correct information and understand the risks to specific groups, such as young women and seniors, of reduced meat consumption. The CPC is doing its part to help producers manage risk. Among the most important initiatives are those related to improving animal health. The Council plays a leadership role in a wide range of animal health organizations including the: National Farmed Animal Health and Welfare Council; Canadian Swine Health Intelligence Network and the Senecavirus A Industry-Government Working Group. Animal Health Canada is a significant undertaking that was launched in September 2018 that will help coordinate efforts to manage animal health issues. The CPC’s PigTRACE program underpins the pig traceability system and is a critical tool to help manage disease outbreaks. The usefulness of the system was again demonstrated during the recent outbreak of porcine epidemic diarrhea in south-eastern Manitoba. The Canadian Pork Council also does very important work “behind the scenes”. From simple things such as managing the flow of funds from producers to groups such as Swine Innovation Porc or sitting on boards of directors (e.g. 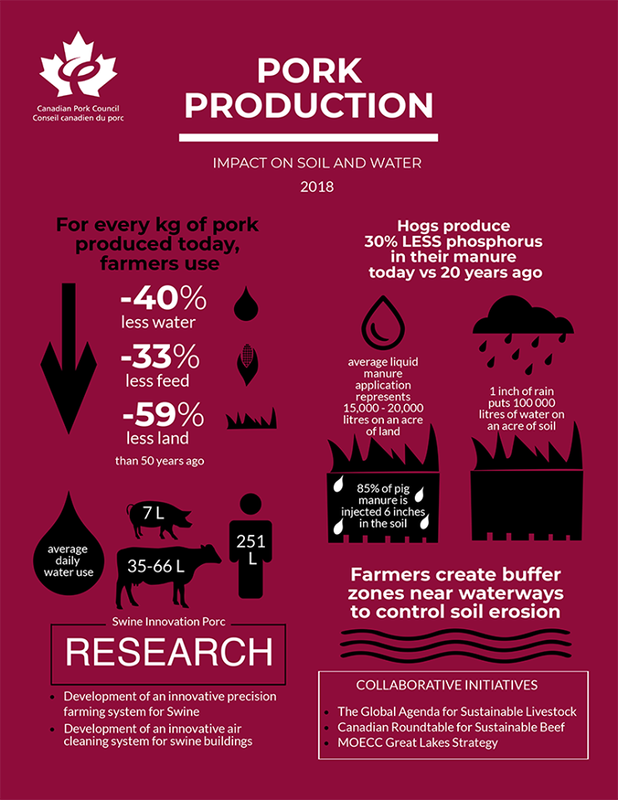 Canadian Centre for Swine Improvement), these initiatives ensure that the risks facing producers are identified and actions are taken to address them. Notwithstanding this progress, the Council continues to have significant concerns with the business risk management (BRM) suite of programs offered by the federal, provincial and territorial governments. The Council has been working with other groups, such as the AgGrowth Coalition, to amplify our message. The establishment of a national checkoff agency and the resulting increase in the availability of funds for research and promotion would enable increased activity. However, despite two separate meetings with the Minister of Agriculture and Agri-Food and repeated discussions with the Minister’s staff and departmental officials, the file remains stalled. It is hoped that with the conclusion of the United States Mexico Canada Agreement that it may finally move forward. Canadians have great faith in the agri-food system that provides them with ready supplies of wholesome, affordable food. However, faced with seemingly endless negative information about their food—often from misinformed individuals—Canadians are demanding to know more about the food they eat. Working through the Pork Value Chain Roundtable, which is co-chaired by CPC, measures are being taken to develop and articulate a sustainability plan. The Council is fortunate to have driven, passionate staff and a group of engaged producers on its Board of Directors. Working together, through various board-level committees or independently on ad hoc projects, these individuals make a difference. As a smaller organization CPC can only succeed when mindsets and priorities align across our country. In working together with our provincial members and colleagues at the Government of Canada, we not only maximize the impact of our resources, we also develop solutions that are much stronger and more likely to be implemented. This collaboration is not limited exclusively to the pork sector. Together with the Canadian Cattlemen’s Association and the Canadian Meat Council, the CPC has begun meeting regularly with Paul Glover, President of the Canadian Food Inspection Agency and his executive team. March 2018 marked the first time that the senior representatives from the major red meat sectors had met as a group with the CFIA management team. In 2018 considerable attention was paid to the functioning of the Council itself. Good governance, sound financial management, openness and transparency are the cornerstones of an effective, efficient organization. Particular attention was paid to financial reporting including the implementation of a new Financial Reserve Policy. Underlying all of our efforts is a very strong communication focus. Producers need to know what their organization is doing and stakeholders need to know what we think. In 2018 a new social media approach was implemented. It is anchored by a newly designed website and provided the tools to reach out to a wider range of stakeholders. A series of customized products, including board meeting summaries and an activity report ensure the CPC’s members know about their Council and its activities. With the new year upon us comes a new series of challenges. determining the value of the Canadian Pork Excellence platform and its fair distribution. Your Council is well positioned to meet these challenges. 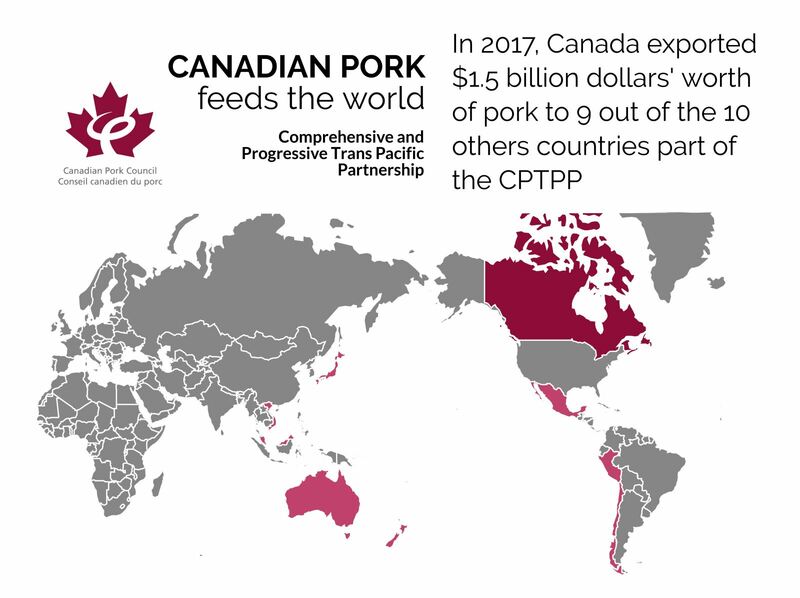 The Canadian Pork Council contributes to the increased value of hogs by expanding market access and differentiating pork in global and domestic markets. The Canadian government's ambitious trade agenda over the past few years has focussed on opening markets for Canadian exporters, including Canada's agri-food sectors. Key trade agreements were at the centre of the CPC's discussions on trade in 2018. The conclusion of negotiations surrounding the Comprehensive and Progressive Agreement for Transpacific Partnership in January 2018, its signature, ratification, and eventual December 30, 2018, enforcement made for a busy 12 months. The CPC demanded quick actions from the federal government, and along with pork producers and industry partners, insisted on the importance of this agreement for the Canadian pork industry. 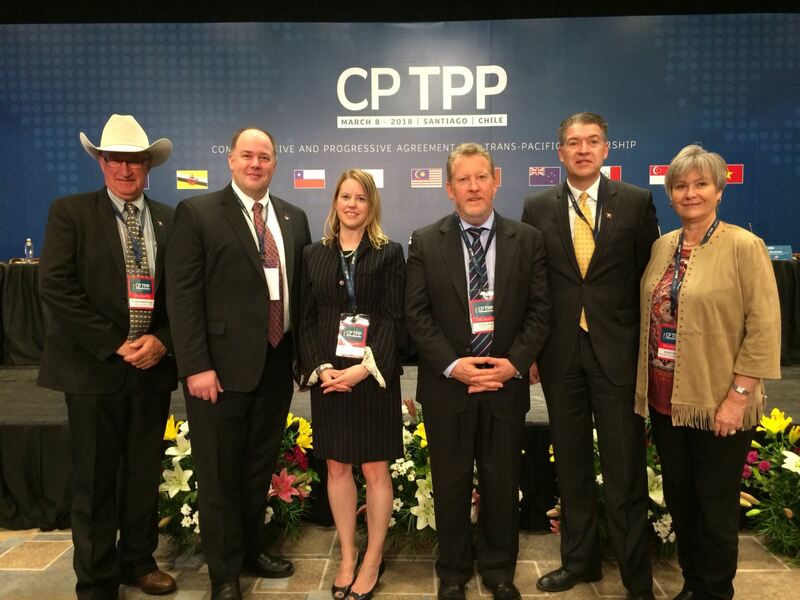 Comprehensive and Progressive Trans-Pacific Partnership. The Canadian Pork Council engaged in trade discussions all through the renegotiation process for an updated and modernized North American Free Trade Agreement (NAFTA). 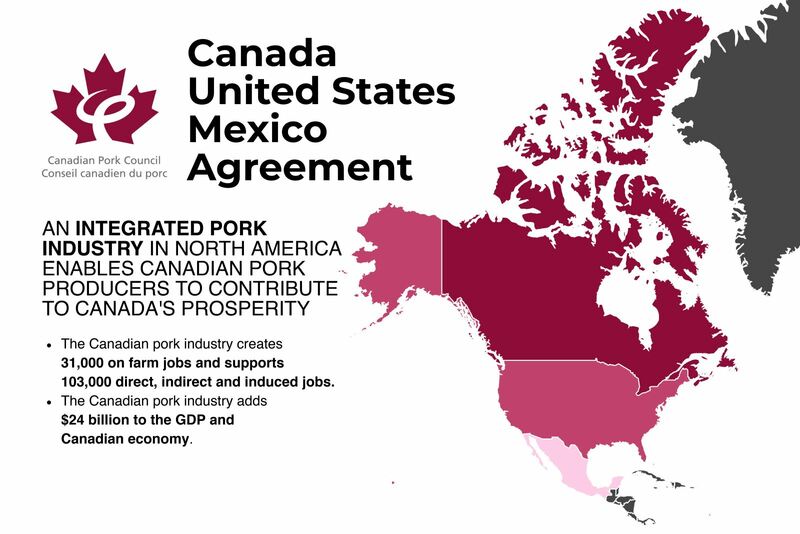 The Canadian Pork Council welcomed the signing of the Canada-United States-Mexico-Agreement (CUSMA) in November 2018 following difficult trade negotiations. Given the high level of integration of the North American pork market, there is great value in the update of the North American Free Trade Agreement. Expanding market access being of great importance to Canadian pork producers, the CPC has been keeping a close eye on the consultations initiated by the federal government on a possible Canada-ASEAN Free Trade Agreement and contributed a strong submission for a trade agreement with the Association of South-East Asian Nations includes the countries of Brunei Darussalam, Cambodia, Indonesia, Lao PDR, Malaysia, Myanmar, Philippines, Singapore, Thailand, and Vietnam. In China, the CPC welcomed news of a pilot project for the exportation of fresh chilled pork, and continues to advocate the importance of a trade agreement with this country. Canadian producers recognize that there is a desire to increase exports and an opportunity for the pork sector to make an even larger contribution to the Canadian economy. Agreements such as the Canada-Korea Free Trade Agreement (CKFTA), Canada—European Union Comprehensive Economic and Trade Agreement (CETA), Canada-United States-Mexico Agreement (CUSMA) and Comprehensive and Progressive Agreement for Trans-Pacific Partnership (CPTPP) gives the Canadian pork industry competitive access to key markets that sustains over 2.8 Billion in sales annually and contribute to reaching the $75 billion agri-food export target established in the 2017 Barton report. The Canadian Pork Excellence platform creates added value for Canadian pork, as it frames food safety good production practises, enhances public trust, ensures supply, regulates market certification and highlights the efficiency of implementation. In order to ensure that on-farm programs continue to reflect the remarkable work of producers and meet the domestic and global consumer demand, Canadian producers and stakeholders have been updating existing food safety and animal care programs with the support of provincial member associations and CPC staff. A “final draft” of the PigCARE|PigSAFE producer manual was reviewed by a Peer Review Committee. This producers-only committee provided its recommendations directly to the CPC Board of Directors. The program was then finalized, supporting material developed and printed, and training material created. 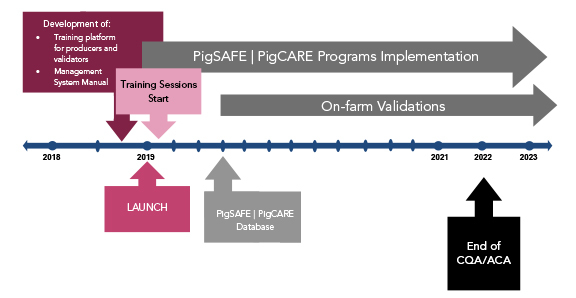 PigSAFE and PigCARE programs will be launched in 2019 with producer and validator training. On-farm validations will begin in the spring of 2019. On-Farm programs part of the Canadian Pork Excellence platform are producers' contribution to the Verified Canadian Pork brand used to market Canadian pork worldwide. Pork producers were able to witness first-hand the results of their work during a trade mission in Japan in March 2018. Producers found that Canadian pork has the best reputation among imported pork in Japan, and that the Verified Canadian Pork brand and Canadian Pork Excellence on-farm programs are key elements behind the trust factor in the safety of Canadian pork. 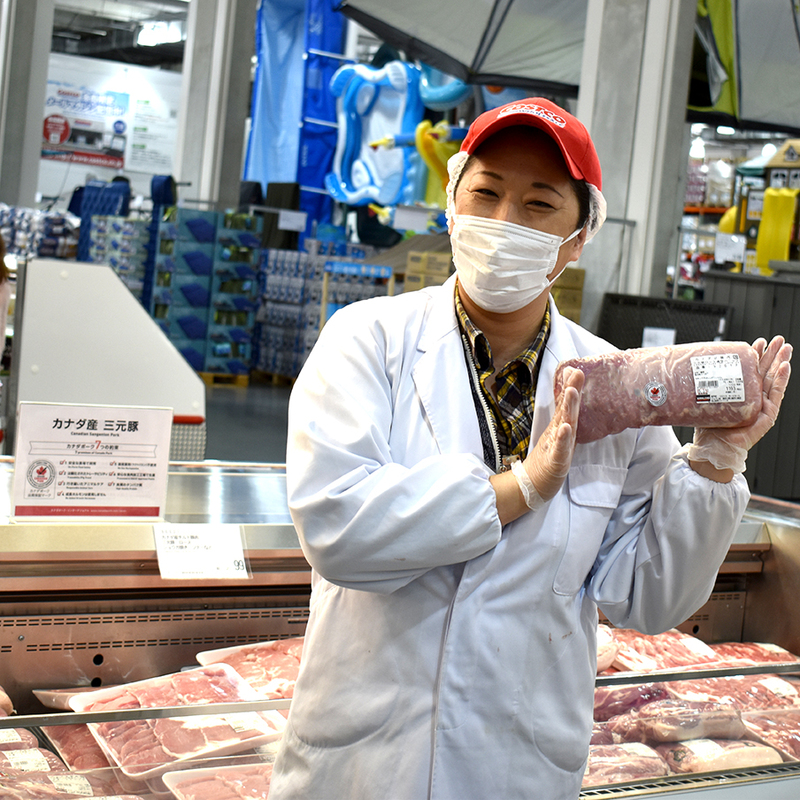 Participants toured supermarkets and retailers, met with heads of companies, learned from Japanese pork producers, importers, customers, restaurateurs and consumers. Delegates also took part in activities with Minister MacAulay and the Canadian Ambassador to Japan. Canadian pork producers who joined in this trade mission were able to see the direct impact of on-farm programs on the reputation of Canadian pork and its importance in the Japanese market. 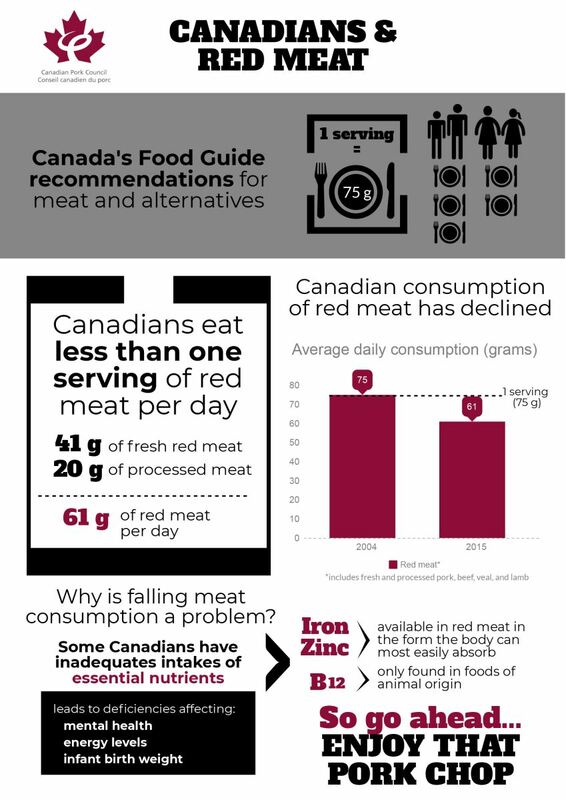 As the federal government continued its work to update Canada's food guide and finalize its Healthy Eating Strategy, the Canadian Pork Council seized every occasion to correct information regarding meat consumption of Canadians and the health benefits of eating pork. The changes to Front of Packaging Labelling and to Canada’s Food Guide were most concerning as there seemed to be an anti-meat bias to the initiatives. On the environmental front, CPC Vice-Chair Hans Kristensen addressed the Standing Committee on Agriculture and Agri-Food (AGRI) during their study of Climate Change and Water and Soil Conservation Issues in February 2018, in Ottawa. The Canadian Pork Council help hog producers manage the animal health, market and competitiveness risks facing the pork sector. As African swine fever marked the second half of 2018 in Europe in Asia, the Canadian Pork Council worked with multiple partners, in Canada and abroad, to prevent the virus from infecting the Canadian pig herd. 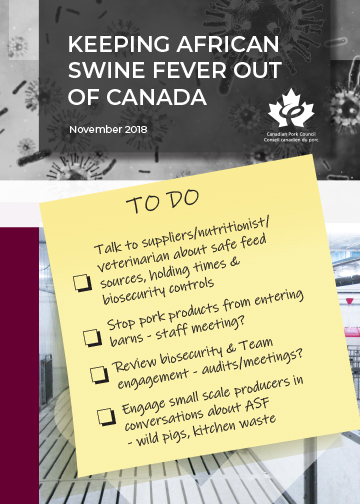 CPC has been informing pork producers, small-scale producers and pet owners about the threat of African swine fever through the development of informational documents, information sessions, outreach on social media and website updates. Actions have been put forward to minimize the risks of ASF infecting the hog herd, and stakeholders are preparing to mitigate the impact of the virus if there was to be an outbreak in Canada. into effect on December 1, 2018. Along with crucial conversations about foreign animal diseases, the CPC has been bringing together animal health stakeholders to address the issue of wild pigs in Canada and their impact on disease propagation. Key personnel are discussing the potential need for a surveillance program, as well as eradication and management strategies. Research is underway to better understand the importance of periodic exercise to the sow. These results are expected in July and will inform discussions on the review of the Code of Practices for the Care and Handling of Pigs. The CPC is fully participating in the process for the review of the Code, and as such, a Technical Code Panel has been established. Members will begin their work in early 2019. We expect that group sow housing will be the focus of discussions for this group. With the objective to enhance the partnership between government and the livestock and poultry industry to better address animal health issues, the initiative Animal Health Canada was launched in September 2018. This project, could, for example, propose a much more robust approach to respond and recover to the finding of a major foreign animal disease within its borders. The CPC is actively involved in the process to further develop Animal Health Canada. The Canadian Pork Council actively participates in the National Farmed Animal Health and Welfare Council’s activities. Rene Roy, 2nd vice chair, and Gabriela Guigou attended the quarterly Council meetings and participated in several working groups within the Council: AMR Stewardship, One Welfare and Emerging Issues. The Council, under the leadership of newly appointed director, Dr. Megan Bergman, will be working on important initiatives in 2019 such as Animal Health Canada and the Implementation of the “animal component” of the Plant and Animal Health strategy. The primary purpose for PigTRACE is to serve as a rapid response tool in the event of an animal health or food safety emergency. The program's data was used during the 2018 PEDv outbreak in Manitoba to generate detailed trace-back and trace-forward reports involving the infected premises. During the federal, provincial and territorial Ministers meeting in July 2018, officials indicated they will continue with the Business Risk Management review on the recommendation of the Expert Advisory Panel. While Ministers have agreed to continue the BRM program review that began in 2017, it is not clear their efforts will result in the meaningful changes required to meet the needs of pig producers. The CPC continues to advocate on producers’ behalf to improve the BRM suite. The Farm Products Council of Canada held Public Hearings into the merits of establishing a Pork Research and Promotion Agency in 2016, and recommended the creation of such an agency. The Minister has spoken in favour of the agency, but no progress has been made on their part since 2016. The CPC continues to meet with government officials to move this file along. Work is underway to enhance the hog sector's relationship with Canadians by transparently providing accurate information about the sustainability of hog production and the wholesomeness of Canadian pork. 2018 proved to be a pivotal year for antimicrobial stewardship. Changes to policies and regulations regarding the access and use of veterinary drugs were fully implemented and became the backdrop for conversations about the prudent use of veterinary drugs. 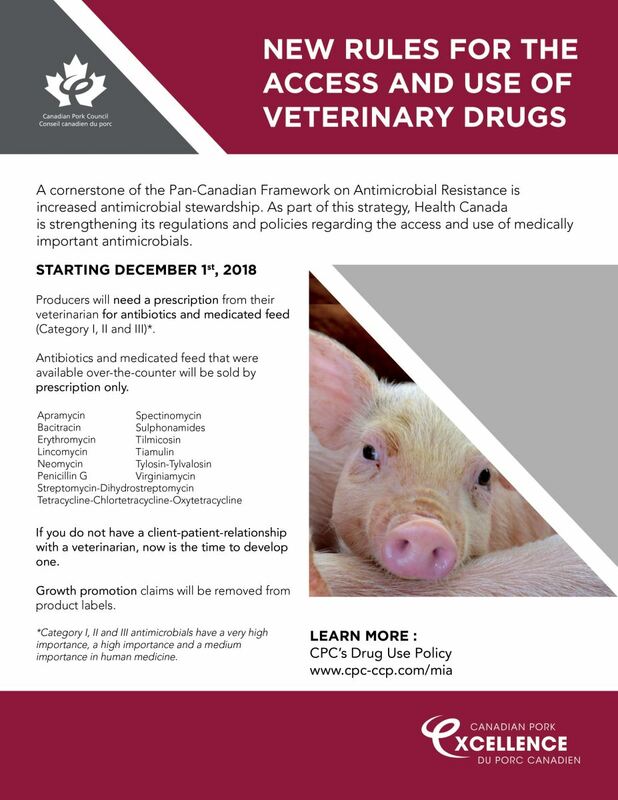 It is important for CPC to address public concerns and demonstrate that swine farmers are working hard to produce a safe, high-quality product while using antimicrobials in a responsible way. Pork producers follow animal care practises outlined in the Code of Practice for the Care and Handling of Pigs developed by the National Farm Animal Care Council and the industry. The CPC's on-farm animal care program, PigCARE, is based on the recommendations outlined in the Pig Code. In order to stay relevant and accurately reflect changes to the industry, codes of practices can be reviewed every 5 years. The CPC is preparing for the review of the industry's code of practice in 2019. A steering committee and a technical review panel were established to undertake this important file. Group sow housing and periodic exercise will surely be the focus of discussions leading to the review of the Code. Discussions and work initiated in 2018 by members of the Pork Value Chain Round Table, specifically the subcommittee for sustainability set the table for the development of material to reach out to Canadians about the realities of pork production. The plan—a Canadian Pork Story—will be hosted on the Council’s website and will highlight the efforts of Canada’s pork supply chain to provide ample supplies of high-quality pork. Canadian Pork Excellence will provide the foundation of the plan supported by a description of the integrity of the food-processing system and the environmental efforts of the entire supply chain. In October, a national, life cycle assessment of the Canadian pork industry was completed by the Quebec-based consulting firm, Groupe AGECO. CPC staff will be incorporating the findings of the assessment into their sustainability messaging. A knowledge-based, open, accountable organization, the Canadian Pork Council provides excellent service to its members and ongoing support to Canadian producers. The Canadian Pork Council held four in-person meetings of the Board of Directors in 2018. Conference calls were held when needed to discuss pressing issues such as the downturn of the Canadian hog price and the outbreak of African Swine Fever in Europe and Asia. A summary of each meeting was forwarded to directors and to provincial pork associations in a timely manner to ensure all interested parties were aware of what was discussed. Throughout the year, the CPC was able to publicly thank its six outgoing directors for their service and invaluable contribution to the industry. Members' meetings were held in April and October of 2018. Well attended by staff members and producers of all provinces, these meetings were occasions for the CPC to better understand the issues facing producers across the country and provide them with information relating to the ongoing activities of the CPC. As a testament of proper financial management and fiscal responsibility, the CPC had a clean audit of its 2017 financial statements in 2018, with a small surplus in its budget. During its 2018 fall meeting, the Canadian Pork Council’s Board of Directors approved 6 priorities for 2019, stemming from the CPC's 2018-2023 strategic plan. In order to ensure that on-farm programs continue to reflect the remarkable work of producers and meet the domestic and global consumer demand, Canadian producers and stakeholders have been updating the CQA and ACA programs with the support of provincial member associations and CPC staff. The updated CQA program is called PigSAFE and the ACA program is called PigCARE. Both will be launched under the Canadian Pork Excellence umbrella in 2019. On-farm validations will start in the spring of 2019. An official reception to mark the launch of the PigCARE /// PigSAFE programs is planned on Tuesday, April 9, 2019. The CPC has been working on the establishment of a Promotion and Research Agency since 2016. Similar to the US Pork Checkoff, the Canadian pork Promotion and Research Agency would collect a levy on all imports of pork meat and pork products regardless of what country the pork was imported from. This levy will be used for a more strategic, coordinated approach to market promotion, market development and research activities for the Canadian pork industry. Now that major trade deals have moved forward, the CPC will continue to work with government officials to get this project implemented. At its July 2018 meeting, the CPC Board has asked that a project be undertaken to establish a Canadian index to price hogs in Canada. This index would provide a better indication of the Canadian marketplace for market hogs. A project steering committee has been established and will work closely with the consultants mandated to move this project forward. The National Farm Animal Care Council (NFACC) requires Codes of Practice to be reviewed after 5 years. As part of the review process of the Code of Practice for the Care and Handling of Pigs, the Canadian Pork Council is establishing a Technical Panel tasked with drafting the review summary report and presenting it to NFACC. Producers support the Code of Practice and have incorporated all 104 recommendations into the PigCARE program but wish to review the timeframe allowed for the conversion to group housing for sows, and explore options to properly enrich the environment of those animals that remain in gestation stalls until full transition to group housing. To further advocate for Canadian pork producers’ needs, an enhanced advocacy program will be proposed at the January 2019 Board of Directors’ meetings. This program will put more focus on face-to-face meetings between producers beyond those on the CPC’s Board of Directors and elected officials and policymakers. This strategy will allow the CPC to present a broader perspective and be even more strategic in its advocacy efforts. The CPC will work with producers to determine the value derived from the three on-farm programs part of the Canadian Pork Excellence platform and engage the processing sector to determine how the value can be fairly distributed between processors and producers.